Is 'Growth Investing' Stalling Your Portfolio Returns? How often have you come across friends or articles highlighting the next multibagger...a stock that has something going in its favour that could multiply its earnings? A quick look at the stock price charts suggest that investing in growth stocks is a hot theme. There is no dearth of stocks that have witnessed a run up in prices in a matter of days based on a brightly painted future. The idea is often backed by a theme or data. For the former, a case in point is Suzlon Energy. Windmills and wind energy companies were riding high on prospects of wind energy in India in early 2008. Clean energy, self-reliance, tax incentives for clean energy, costly oil...the reasons were hard to ignore. However, the story did not unfold as expected... And those who seized this seemingly good opportunity with both the hands were left with a dud stock. The concept of 'growth investing' can manifest itself in many ways. In an economy that is likely to grow in the single digits at best, the companies with growing earnings look like a sure bet. But do such bets pay? Do you filter for historical earnings growth when researching equity investments? Over simplifying this can not only cause your portfolio to not only stagnate but erode. A 20%-plus growth in earnings in the past five years is no guarantee the run will continue. Take telecoms for example. The industry, once a front-runner in terms of growth, is now known for tariff wars and the impending consolidation where a few players will gain at the expense of the many. If growth is your basis of investing, you must always question if the company can continue to grow at the assumed rates. If earnings growth is your only filter, you need to look beyond. Earnings are one of the most easily manipulated parameter. Further, a company can chase growth by taking more debt and in a way that does not suggest best allocation of capital.Such earnings are not sustainable. The damage to the balance sheet, however, is more or less permanent. Take the case of DLF Ltd, a company that fuelled expansion through borrowed money. Once a hot-selling growth stock, the company is now desparate for a turnaround. Chasing such companies is hardly a good idea. The biggest challenge in growth investing is that there is so much money chasing stock markets that stocks with any growth prospects carry unrealistic valuations and unrealistic expectations. The mantra for successful investing is buy cheap, sell dear. And growth stocks are no exception. In an uncertain future, your best defence is margin of safety. Irrespective of growth potential, if you buy a stock that is already pricing in the future growth, your risk-reward ratio is unfavourable. Even if the earnings growth takes place, it may not reflect in portfolio returns. Remember, your success is not in owning stocks with growing earnings, but with growing returns. The valuations at which you buy growth stocks matter. Be cautious of the lure of hot stocks. Go for beaten down growth stocks than glamorous growth stocks riding on high PEs. Always factor in the margin of safety...even if that means not acting at the moment. Indeed, some of stocks that were recommended were not immediately actionable... but margin of safety is something that we will never compromise on. The team looks for bottom up stock ideas without isolating them from broad economic trends. The research and recommendation is backed not by themes floating around; but by management meetings across the length and breadth of the country... The task is not just limited to identifying growth stocks, but deciding the weight a stock deserves in the portfolio at a particular time. Unlike the general way it works - buying a story and chasing stock price, the team uses volatility to its advantage to buy stocks at attractive valuations. Returns like 288% in 2 years and 5 months, 124% in just 7 months, 250% in 2 years, 123% in just 3 months and more... all from the small cap segment... are too good to be missed. However, the problem most investors face is that they don't have access to reliable research on the small cap segment. But you won't have that problem. Because we at Equitymaster have been recommending high-potential small caps for more than 7 years. And as you can see from the returns above, we have done a good job at identifying them from hundreds of stocks in this segment. India's exports have been on a major slide. The reasons are varied. Demand slowdown in the developed world and China, lack of competitiveness, increasing competition from other developing countries, an over-valued currency, lack of domestic reforms are all to blame. While there is no magic solution, a good place to start would be to get a holistic picture of the slowdown. As per an article in Livemint, India's export slowdown is worse than it seems. As today's chart shows, the major decline is not exports to the US. Rather Asian countries are not so gung ho about India. 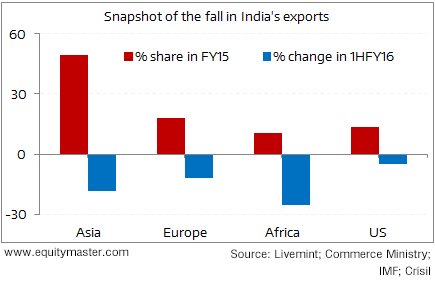 Asia accounts for nearly half of India's exports and the fall has been quite sharp in the first six months of FY16. While fall in US exports was just 5% YoY, exports to Asia was down 18.6% YoY in 1HFY16. This clearly highlights the magnitude of the problem. Depending on a broad based economic recovery in the developed world would be futile in our opinion. India has long and difficult path ahead in the quest to become an export powerhouse. The RBI recently held all key interest rates constant. This was largely on expected lines. However, there are many challenges ahead. Inflation could trend up higher than expected. The US Fed's rate hike on 16 December now looks inevitable. The rupee has looked vulnerable recently. Growth hasn't picked up significantly. Corporate performance has been nothing to write home about. Monetary policy cannot address all of the country's economic concerns. That said the RBI has quite a lot on its plate we believe. It needs to maintain its accommodative stance and yet keep inflation expectations in check. This is no easy task. Other concerns have crept up recently. In two consecutive government bond auctions last month, the RBI had to accept bids at below its pre-determined cut-off price due to low demand. Clearly, foreigners who have been big investors in the Indian bond markets are getting nervous. The lack of economic reforms has made matters worse. If there's an adverse reaction to a rate hike by the US Fed, India could witness capital outflows. This would take a toll on the currency. The last time this happened, the Rupee fell to a record low of around 69 to the US$. A repeat of the same would make imports, including crude, more expensive, thus driving up inflation. Can the RBI continue to cut interest rates in such a situation? We don't envy the position it is in right now. After opening on a positive note, the Indian markets slipped into the red in the afternoon session. At the time of writing, BSE Sensex was trading lower by about 99 points. Losses were seen in FMCG and metal stocks while healthcare and realty indices were trading in the green. The midcap and smallcap indices were trading on a flat note. This edition of The 5 Minute WrapUp is authored by Richa Agarwal (Research Analyst). Equitymaster analyses Initial Public Offering (IPO) of Alkem Laboratories, one of the leading player in the Indian domestic market. Equitymaster requests your view! Post a comment on "Is 'Growth Investing' Stalling Your Portfolio Returns?". Click here! 1 Responses to "Is 'Growth Investing' Stalling Your Portfolio Returns?" I am regular reader of 5 minutes. Kindly go through the sight billionsinchange.in what is your opinion on Manoj Bhargav ideas and how this may transform entire India (World). He is starting with water project in Uttarakhand soon. I urge you to feature him in 5 minutes reading some day. He is also available on youtube. I am impressed with this ideas & sure you will like as well.